The two-year M.F.A. in Film and Television Producing is a mentoring-focused, hands-on program that explores all aspects of film producing including both the business and creative dimensions. During your first year you will get a foundation in producing and learn the best practices in the industry. 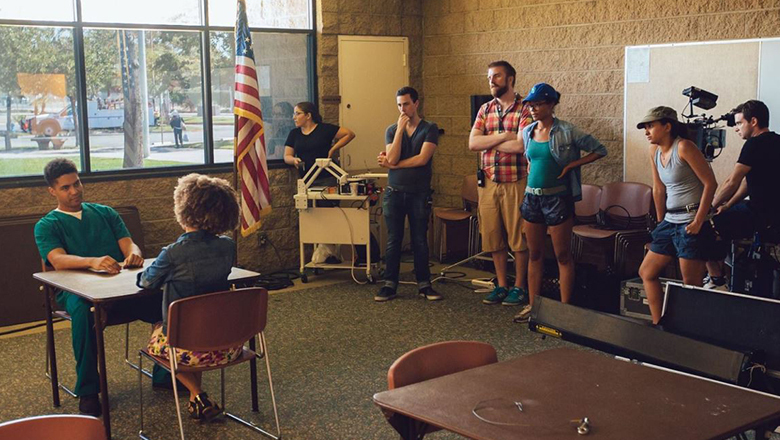 You will immediately apply these skills on various student film productions. Throughout this process, you’ll be closely mentored by our industry active faculty comprised of producers and executives. During your second year, you’ll hone your skills and delve deeper into the creative aspect of production as you develop a creative portfolio and fully produce a thesis film project in collaboration with the production students. You'll leave the program with knowledge of, and experience in, physical production and the creative development process. Complete 48 credits at the 500 or 600 level. Pass an oral defense of the thesis project(s). The following sequence of courses prepares students for successful completion of the thesis project. The courses must be taken in the following order, during the semesters indicated. Any deviation must be approved by the film division chair. Demonstrate the advanced skills necessary to evaluate creative material and its potential as well as to manage the business elements of production, legal and intellectual property rights, marketing, financing and distribution internationally for film, television and the internet. Work collaboratively and effectively within the structure of a film crew, helping to maintain a singular artistic vision. Through closely mentored projects, demonstrate advanced knowledge and astute interpersonal and practical skills to produce film or media projects from start to finish. Demonstrate the ability to create a comprehensive project proposal, written in clear and concise language within an organized format that presents a compelling and professional presentation of the material. In order to apply to the Film/Television Producing graduate program, you must submit the required application materials, as well as a Creative Supplement. The application will go live in July, and more instructions on the application process will be updated on our website soon. No additional information should be sent to Dodge College or the Office of Admissions outside of what is required on the application. Any outside work sent to either office will not be reviewed as part of the admission process. Dodge College is hosting both in-person and online informational sessions for prospective graduate students.